Wireless security cameras are of one of three types: (1) analog, (2) digital, non-Wi-Fi, and (3) Wi-Fi based. The first two of these types can cause non-Wi-Fi interference. Prevalence: Digital wireless security cameras are popular today, with analog video cameras almost phased out. In fact, an increasing fraction of such cameras are Wi-Fi enabled, but non-Wi-Fi digital security cameras are quite prevalent. The figure above rates their prevalence as low-to-medium, given that wireless security systems are generally installed commonly only where there is no wire or Ethernet drop easily possible. The prevalence is rated higher though, than cordless phones, since it is more common to find wireless security cameras than cordless phones, in enterprises today. 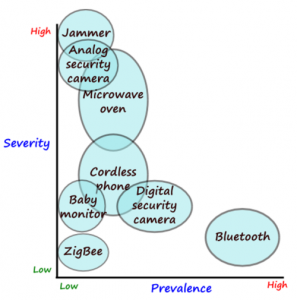 The technology underlying security cameras is also re-purposed for similar devices, such as baby monitors (e.g. Lorex is a popular vendor of security cameras as well as baby monitors). However, social norms typically mean that baby monitors are almost non-existent in work-places. Severity: Older analog wireless security cameras are mostly fixed frequency devices, with higher potential for affecting Wi-Fi APs in overlapping frequencies. In fact, these analog cameras can have a 100% duty cycle, which is even higher than that of a Microwave oven, which has a 50% duty cycle. Fortunately, digital wireless cameras have mostly replaced analog ones today. Most digital wireless security camera systems are based on frequency hopping spread spectrum (FHSS), with several tens of hops per second over the entire 2.4GHz frequency band, occupying a few MHz at a given time. In the example shown below, the wireless security camera hops about 25 times a second, and occupies abot 2MHz at a time. Given such hopping, and a typical transmit power of 10-20 dBm (in comparison a typical AP transmits at 20dBm) , the severity with which Wi-Fi is affected is limited to few tens of feet, and even at this range, the throughput loss is much less than with microwave interference. Subtleties: The severity with which a frequency hopping non-Wi-Fi source affects Wi-Fi depends on two factors: the bandwidth at a given instance, and the transmit power. In this sense, the severity of digital wireless security camera is comparable to that of a digital FHSS cordless phone, while that of Bluetooth is much lower due to its lower transmit power. The figure below shows the frequency hopping patterns of a wireless security camera as well as that of a baby monitor (for clarity, only the first 40MHz of the 2.4GHz band is shown), collected using our spectrum analyzer. Avoidance: As mentioned, wireless security cameras are common only in places where it is difficult to run wires (e.g. remote corridors, delivery/pickup area, server room, etc.). Further, areas monitored through a wireless security camera are away from the main work-area, for naturally, the necessity to monitor an area where people normally work does not arise. So this naturally avoids significant interference from such sources at places where people work. Alternatively, choosing Wi-Fi based wireless security cameras would avoid such cameras as non-Wi-Fi sources of interference, merging the video traffic with other Wi-Fi traffic. Should there still be a concern, operating nearby Wi-Fi access points in 5GHz will completely avoid this interference. Prevalence: ZigBee, or IEEE 802.15.4 is an industrial standard designed for ultra-low-cost and low-power embedded sensing in industrial and medical applications. In hospital settings, devices using ZigBee can be more prevalent than in regular work areas. On the horizon, there are some popular applications of such sensing in common buildings too, smart energy usage being an important one. Still, such devices in common enterprise offices are rare. Severity: The bad news is that unlike digital cordless phones, digital security cameras, or Bluetooth, ZigBee is a fixed frequency technology; it has 16 possible 5MHz channels in the 2.4-2.4835 GHz band. However, ZigBee is extremely low power (0dBm or less) by design, and usually generates very little traffic (a few bytes per second or less). Avoidance: As explained above, ZigBee is not a credible source of interference for Wi-Fi. However, it is well known that Wi-Fi can even entirely shut-down ZigBee, which does not even have the frequency hopping protection that Bluetooth has. Therefore in settings where ZigBee is used in critical applications, such as medical sensing, or industrial safety applications, one has to worry about interference caused to these networks. To avoid interference caused by Wi-Fi to ZigBee, the options here are: (a) operate Wi-Fi in the 5GHz band, (b) operate ZigBee in the 868 MHz or 915 MHz bands; ZigBee has ten channels available here, but they are not license-free world-wide, or (c) if the application does not involve life versus death, ensuring that the ZigBee system has very good radio resource management, such as choosing a relatively free 5MHz channel may be sufficient. Severity: The very purpose of a jammer is to disrupt the network, so a jammer can entirely shut down Wi-Fi in the vicinity. Prevalence: The prevalence of jammers is fortunately low, as they have no legitimate use. Avoidance: Unfortunately, by the very nature of a jammer, it is not possible to avoid. However, unlike the other sources of interference, which have a legitimate use, the only purpose of a jammer is to disrupt the network. It is therefore considered a security threat (denial of service attack), and is usually detected by a wireless security system. Non-Wi-Fi sources of interference, current or future, can be classified on the two dimensional plane of severity versus prevalence, and an appropriate avoidance or mitigation strategy can be devised based on this. Authors Bio: Bhaskaran Raman is a scientist at AirTight Networks, working on high performance Wi-Fi architecture. Bhaskar received his M.S. and Ph.D. in Computer Science from the University of California, Berkeley, in 1999 and 2002 respectively, and his B.Tech in CSE from IIT Madras, India in May 1997. He was a faculty in the CSE department at IIT Kanpur from 2003-07. Since July 2007, he has been a professor at the CSE department at IIT Bombay. His research interests and expertise are in wireless and mobile communication networks. Bhaskar was a recipient of the IBM Faculty Award in the year 2008. He has published research papers in various IEEE and ACM conferences and journals, and is on the editorial board of ACM Computer Communication Review.